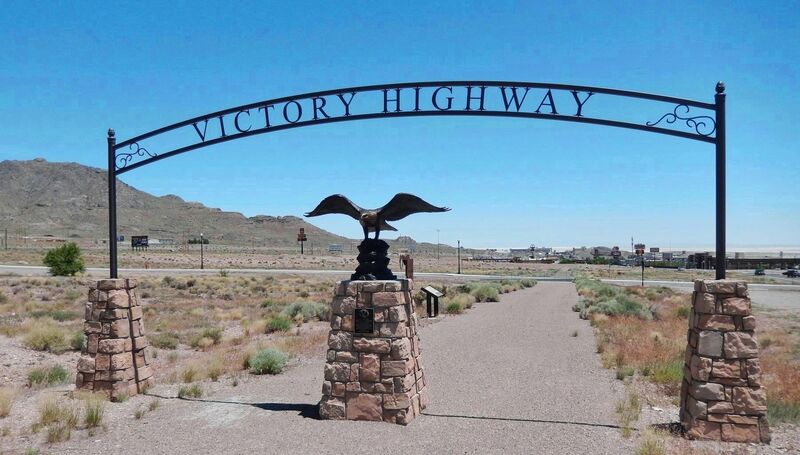 The Victory Highway monument is a representation of the earlier bronze eagle markers of the 1920s. Original eagle markers were to be located at each county line with a plaque dedicated to the sons and daughters who served their country in World War I, sacrificing their lives for our freedom. Only five original bronze eagles are known to be in existence, two in Kansas and three in California. 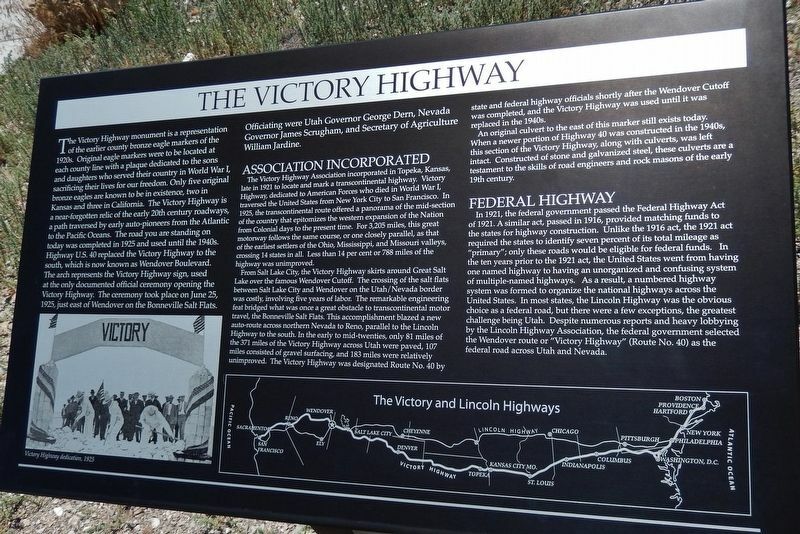 The Victory Highway is a near-forgotten relic of the early 20th century roadways, a path traversed by early auto-pioneers from the Atlantic to the Pacific Oceans. The road you are standing on today was completed in 1925 and used until the 1940s. Highway U.S. 40 replaced the Victory Highway to the south, which is now known as Wendover Boulevard. 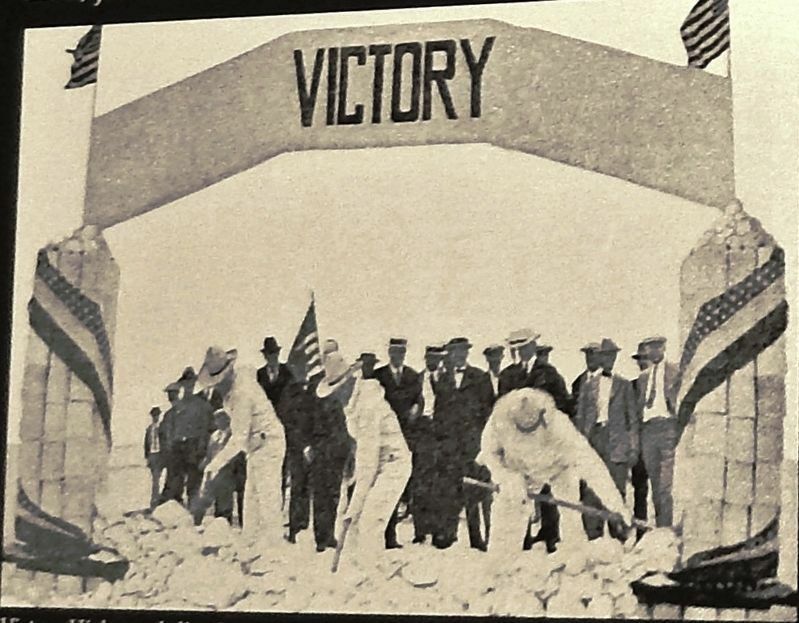 The arch represents the Victory Highway sign, used at the only documented official ceremony opening the Victory Highway. The ceremony took place on June 25, 1925, just east of Wendover on the Bonneville Salt Flats. Officiating were Utah Governor George Dern, Nevada Governor James Scrugham, and Secretary of Agriculture William Jardine. in Topeka, Kansas, late in 1921 to locate and mark a transcontinental highway. Victory Highway, dedicated to American Forces who died in World War I, traversed the United States from New York City to San Francisco. In 1925, the transcontinental route offered a panorama of the mid-section of the country that epitomizes the western expansion of the Nation from Colonial days to the present time. For 3,205 miles, this great motorway follows the same course, or one closely parallel, as that of the earliest settlers of the Ohio, Mississippi, and Missouri valleys, crossing 14 states in all. Less than 14 per cent or 788 miles of the highway was unimproved. state and federal highway officials shortly after the Wendover Cutoff was completed, and the Victory Highway was used until it was replaced in the 1940s. An original culvert to the east of this marker still exists today. When a newer portion of Highway 40 was constructed in the 1940s, this section of the Victory Highway, along with culverts, was left intact. Constructed of stone and galvanized steel, these culverts are a testament to the skills of road engineers and rock masons of the early 19th century. the federal government selected the Wendover route or “Victory Highway” (Route No. 40) as the federal road across Utah and Nevada. Location. 40° 44.442′ N, 114° 4.368′ W. Marker is in West Wendover, Nevada, in Elko County. Marker can be reached from Wendover Boulevard west of North Gene L. Jones Way, on the right when traveling west. Touch for map. 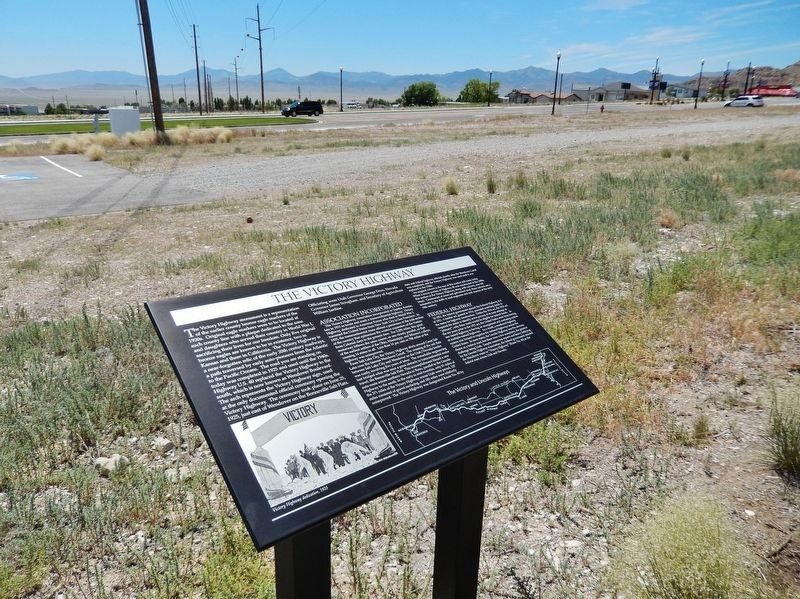 Marker is located along the south side of the Victory Highway Monument Arch walkway, south of the West Wendover Police Department complex parking lot and just north of the giant "Wendover Will" landmark. Marker is at or near this postal address: 1552 Wendover Boulevard, West Wendover NV 89883, United States of America. Touch for directions. Other nearby markers. At least 8 other markers are within walking distance of this marker. Lincoln Highway (here, next to this marker); Western Pacific Railroad (a few steps from this marker); Historic Wendover Field (a few steps from this marker); Ancient Lake Bonneville (a few steps from this marker); The Hastings Cutoff (within shouting distance of this marker); Transcontinental Telephone Line (within shouting distance of this marker); Wendover Will Reclaims Skyline Once Again (within shouting distance of this marker); 509th Composite Group – First Atomic Bombardment (approx. 0.9 miles away). Touch for a list and map of all markers in West Wendover. More. Search the internet for The Victory Highway. Credits. This page was last revised on March 26, 2019. This page originally submitted on March 25, 2019, by Cosmos Mariner of Cape Canaveral, Florida. This page has been viewed 129 times since then. Photos: 1. submitted on March 25, 2019, by Cosmos Mariner of Cape Canaveral, Florida. 2, 3, 4, 5. submitted on March 26, 2019, by Cosmos Mariner of Cape Canaveral, Florida.